Ritual Wine Container (Yu), 11th century B.C. 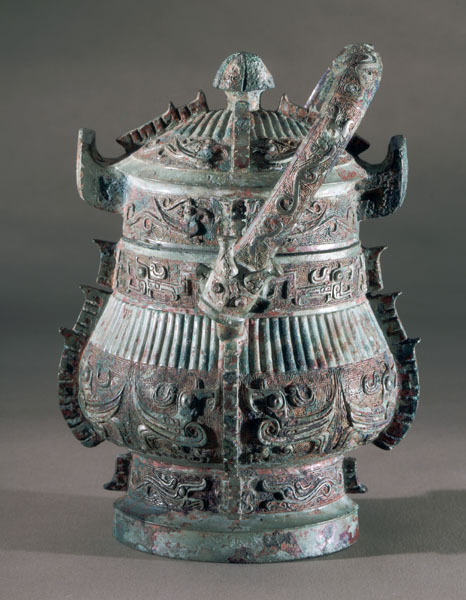 This yu, or lidded wine jar, is a splendid example of the Shang bronze caster's art. Both lid and body are richly ornamented with a band of vertical ribbing, which contrasts with the densely patterned bands of stylized birds on a ground of squared spiral whorls (lei wen). The mold joins that divide the vessel into quarters have been exploited to give the container its spiky, expressive silhouette. Three-dimensional animal heads decorate the ends of its swinging handle. The exquisite patina, valued highly by collectors and connoisseurs, is not an intentional artistic effect but accidental, resulting from the interaction of the copper in the bronze with moisture during the vessel's years buried underground in a tomb. The one-character inscription is probably a clan name. Bronzes like this one are the primary sources of information on ancient China. The production of vessels of such sophistication implies the existence of wealth, highly developed bronze technology, and a ritual system.